This 16.9-ounce water bottle is a single wall bpa free tritan bottle to take on the go. It's hot new feature making it the must have water bottle is it's leak proof sealing lid. This lid is in addition to the standard bottle top lid, it also features a twist open body starting just at the sight where the standard water bottle is its biggest diameter. The hydra bottle also has a second amazing must have feature. 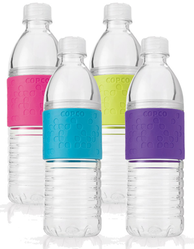 It's the cool soft grip textured non slip sleeve that makes holding the bottle simple and comfortable. The design of the bottle makes it easy to hand wash, the favorite option of cleaning water bottles. I saw this bottle featured on my morning news program. They highlighted it as one of the best products of the new year. I just had to have it and share it with my devoted readers. Enjoy your Hydra Bottle. I had to have the teal blue, ok I confess I also got the lime green and highlighter pink,what colors are you getting? This is the perfect bottle for everyday drink needs. 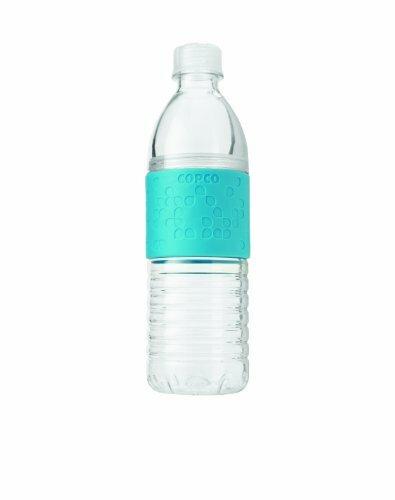 This feel good bottle is the perfect bottle for school, work or anytime you want to have water on hand. My two daughter and myself drink nothing but water throughout the day. We have tried all the other eco friendly water bottles only to set them aside as they aren't near as user friendly as the standard purified water bottle. This bottle actually has a screw top lid allowing easy access for adding ice, lemon slices and more beverage. The hottest feature of the Hydra Bottle is shown above. This is a perfect addition to the reusable eco-friendly water bottle. The screw threads are sturdy and lock for a leak proof bottle. This amazing bottle proves itself with amazing new features that all meet the claims. Finally a great green water bottle we can actually use. katiem2, The grip and the lid make hydra-bottles convenient and necessary. It's great to scent water with citrus slices (which then can be yummily eaten) and know that the bottle can be reused, and citrus residue removed, because of two-pronged cleaning access to the difficult, narrow lid. bri, They would indeed work for adult beverages. lol thanks for asking. Pinkchic, I love the hydra bottle the screw top feature is exactly why I bought it but now love it for the grip for holding and the bottle size as I can take it and use it anywhere. I just got my dad one of these. I love that it screws off at it's widest point too so you can actually clean it well, and you can put things in there much easier like ice! Great lens, nice feature! This bottle is great, the kids will love being able to add ice to the hydra bottle. My kids can use this with all the sports activities we have this is perfect. Pam, The hydra bottles are great, we love them. I love this idea, I drink water with lemon slices all the time, it's good for stimulating all the wonderful metabolism factors anyway this bottle will be perfect for this. I love it. Get the facts on the easiest way to get your legs in shape with as little time as possible and avoid fat flabby legs this summer. Look good in shorts, skirts and dresses.